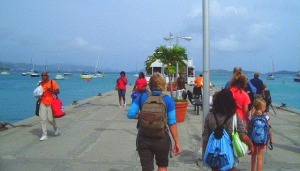 to visit more than one of the islands, or possibly stay in more than one place on one of the islands. Here are some suggestions for planning your stay. For Virgin Islands vacations of three days to a week, keep in mind that one day on each "end" of the trip will be a travel day, not really a day you enjoy in the USVI. You may want to stay on one island for the duration, perhaps with a day-trip to one of the other islands. A day-trip from St. Thomas to St. John or vice-versa is especially easy, since they're only a couple of miles apart, and there's hourly ferry service between the two islands all day long, year-round. There's also a ferry running between St. Thomas and St. Croix in the high season, and short-hop flights year-round. For a week long trip, you might consider two days on one island and three days on another (or possibly one day and four). If you have a week-and-a-half or two weeks (or more), you could easily split your stay between two or even all three of the islands. If you decide to stay on one island, I suggest you still at least do a day-trip to one of the other islands. After all, you've come this far, why not look around a little? 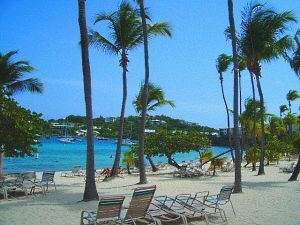 One major consideration is what your odds of coming back for future Virgin Islands vacations are. If this is your one and only foreseeable vacation to the USVI, you'll want to get more travel and activities into the trip. On the other hand, if you figure that you'll be coming back time and again, year after year (or even more than once a year), you may want to take a more relaxed approach to each trip; consider each of your vacations as another opportunity to explore the islands further.